The Hurtwood gained a new name, a new management team and a new strategy at its annual general meeting on Tuesday April 13th. The charity managing public access on this beautiful tract of open countryside between Holmbury, Albury, Shere, Peaslake, Blackheath and Ewhurst, will now be known as Friends of the Hurtwood. Its old name, the Hurtwood Control Trust, had been felt to convey unintended authoritarian overtones. The chairman of the trust, Jeremy Raisman, stepped down after 10 years in the volunteer role and the new trustee chairing the Friends of the Hurtwood is Peter Copping, a retired consultant engineer. The aims of the charity remain the same – to provide high quality public access over privately owned forests and heaths. The greater part of the Hurtwood lies within Shere Manor Estate and the Bray family dedicated the land to the public for air and exercise in 1926. The present Lord of the Manor, Handa Bray, remains a trustee of the Friends of the Hurtwood. Key elected trustees will have specific roles under the new management system. Jennifer Ullman, who will be responsible for directing the work of ranger Mark Beaumont, is an experienced professional manager of public open spaces including Wandsworth Common and is a trustee of the Royal Botanical Gardens at Kew. Sheri Johnson, trustee responsible for communications, is an IT specialist, with strong business and marketing skills. Both Jennifer and Sheri walk and ride through the Hurtwood regularly and see their new voluntary roles as a means of giving something back to an area they love. There are vacancies for elected trustees for fundraising and for financial management so anyone with relevant professional experience who is interested in these volunteer roles should contact Peter Copping. The new management structure is designed to take the administrative burden off the ranger and free his time for operational duties, and provide the Friends with a stronger base for increasing income and involving the community in looking after and enjoying the Hurtwood. There was an excellent turnout of members for the meeting held at Duke of Kent School and the changes were voted through with an overwhelming majority, strengthened by the support of Jeremy Raisman and by Handa Bray, two stalwart champions of the Hurtwood. 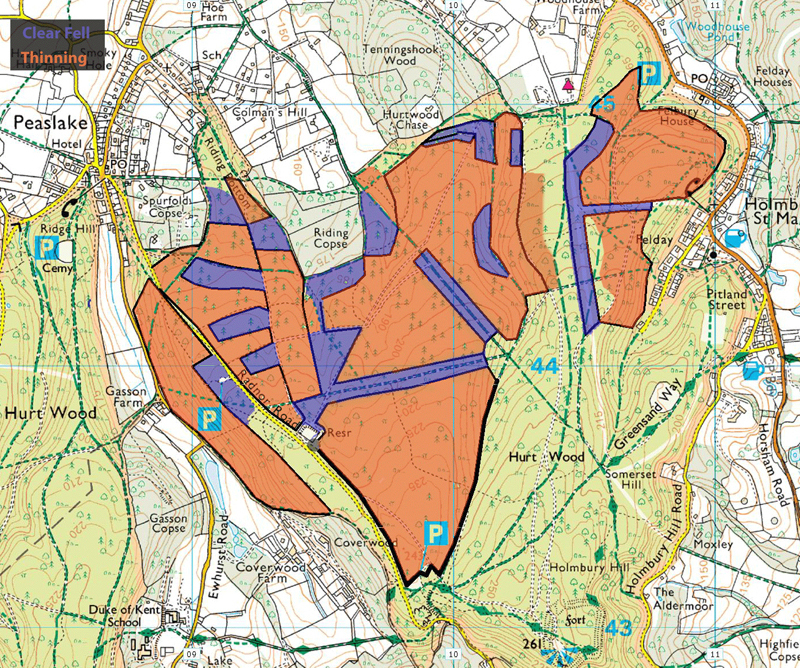 A forestry programme of thinning and felling trees will continue across the Hurtwood throughout 2010. The primary focus of The Hurtwood Control is to maintain visitor safety so we advise all visitors to heed site notices and to be especially careful when using any trails in the vicinity of forestry operations as heavy plant and machinery may be in use. This safety advice applies particularly to bikers; many of the legacy trails used by bikers could be impacted during the course of 2010 and some closures are inevitable. We will do our best to protect these trails, especially those which have been part of the maintenance programme instigated by biking volunteers during the last couple of years. There will obviously be disruption for visitors during the programme; though it is our intent to keep open all affected areas of the Hurtwood if at all possible. Areas of significant damage by heavy plant on the main trails will be reinstated by the Estate’s contractors on conclusion of the programme. The logistics and timing of the programme is being managed by Shere Manor Estate. As the felling work is weather dependent, it is not possible to know in advance when each area will be affected. As and when we receive this detail; we will endeavour to notify you via the website.